Beginning July 13 and continuing for the next three weeks, we will release one or two items on our list per day, beginning with No. 25 and working our way up to story No. 1. Today, we announce No. 15. It’s a difficult thing to accomplish – running the table in a 20-game high school soccer season. The Lone Peak High girls soccer team was on the verge of that monumental accomplishment in the fall of 2014 until it ran into a supremely talented Davis squad on the biggest stage. The Knights had a deep and highly skilled group of their own, regularly playing 16 or more players significant minutes and distributing the defensive and goal scoring load across most of those players. 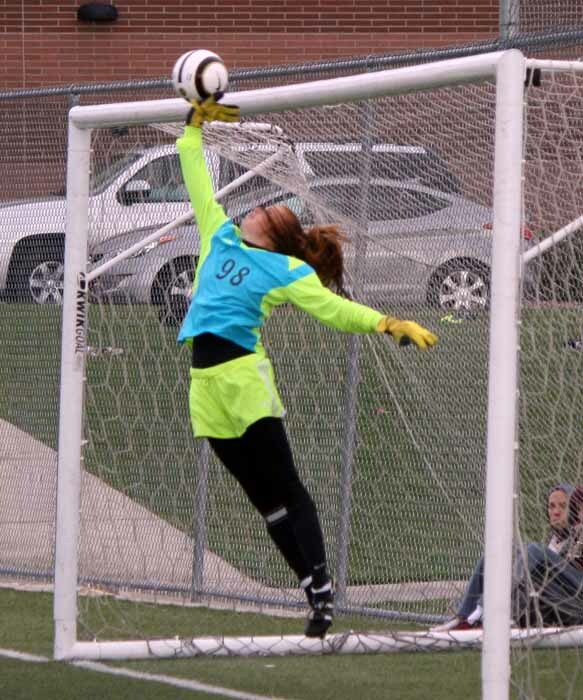 All year long, opponents found it all but impossible to answer the challenge of Lone Peak, particularly since senior goalkeeper Cassidy Smith, who will move on to play at Brigham Young University in the fall, was perhaps the best netminder in the state. Lone Peak had to survive a region that featured Riverton and American Fork, and even when the Knights struggled to post a ton of goals, including in the state quarterfinals (1-0 win over Fremont) and semifinals (1-0 win over Alta), that defense was dominant. 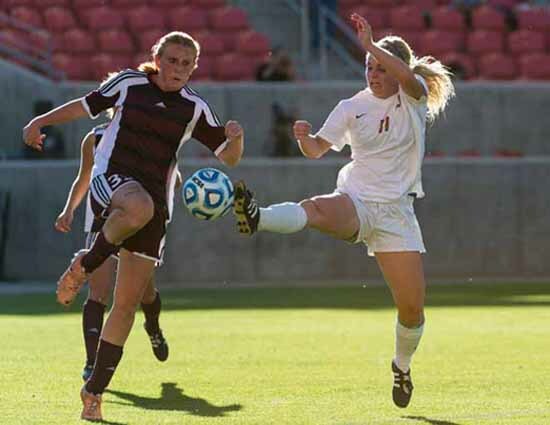 Coach Heather Dahl’s Knights came into Rio Tinto Stadium for the state title game with a record of 19-0, having fought off every single challenge. It was a team built around a core group of five outstanding seniors, but which also drew on the strength of depth from a group of talented juniors and a very strong sophomore class. As things turned out, keeping the unbeaten streak running for that 20th contest was more than Lone Peak could manage. That was largely due to the presence of a young Davis team on the other end of the pitch. The Knights had beaten the Darts way back in August, 1-0, on a breakaway and finish by sophomore Cameron Tucker, who was the only Lone Peak player to score double-digit goals for the season (14). It was just 10 minutes into the rematch at the home of Real Salt Lake when Davis picked up its first goal of the season against the Knights. Juniors Ireland Dunn and Regyn Youngberg connected on a pass and finish that gave the Darts a 1-0 advantage. Davis almost wasn’t even at Rio Tinto to take a shot at ending Lone Peak’s undefeated streak. Despite dominating the run of play for most of its semifinal battle with defending state champion Brighton, goals did not come. The contest was tied 1-1 late in the second overtime, after more than 99 minutes of soccer. Fortunately for Souli Phongsavath and the Darts, regulation and two overtimes require 100 minutes before the teams go to the all-too-uncomfortable penalty kick shootout. With the stadium clock at Juan Diego Catholic High School showing just 12 seconds remaining in the second extra session, Dunn received a pass near the 18-yard line, pushed the ball to her right to elude the Bengal defense, and found what she was looking for as no Brighton defenders stepped to her. The junior striker was left with a great look at the right corner of the goal, from straight on, about 15 yards out. On a day of near-misses for the Darts, with the game on the line, and the teams staring at the possibility of deciding the matter from the 12-yard spot, Dunn did not miss. She unleashed a laser-like right-footed blast the ripped the net just inside the post, sending the Davis side into celebration and Brighton to shock. The goal gave the Darts a 2-1 double-overtime victory that eliminated the defending champs and sends Davis on to Rio Tinto to face unbeaten Lone Peak for the state championship. After taking the 1-0 lead in the state finale, the Darts used an outstanding defensive strategy to frustrate Lone Peak. Davis kept the Knights largely outside the penalty area and kept them from getting good looks on frame. In the 55th minute, Youngberg was fouled just at the 18, and the referee awarded the penalty kick. The junior striker stayed down and had to leave the pitch due to any injury, and then Phongsavath made another really good coaching decision. “I have a girl that has taken them (PKs) throughout the year,” Phongsavath said. “Right when it happened, I tried to look for that girl (she’s a sophomore). The older girls that I’ve known really well, I knew that none of them would want to take that penalty kick, so I looked for that other girl, but couldn’t find her right away. Lone Peak responded with a newfound sense of urgency and a goal by senior Natalie Lewis in the 64th minute made it a one-goal game, but despite pounding away at the Dart defense the rest of the way, the Knights were not able to get the equalizer. 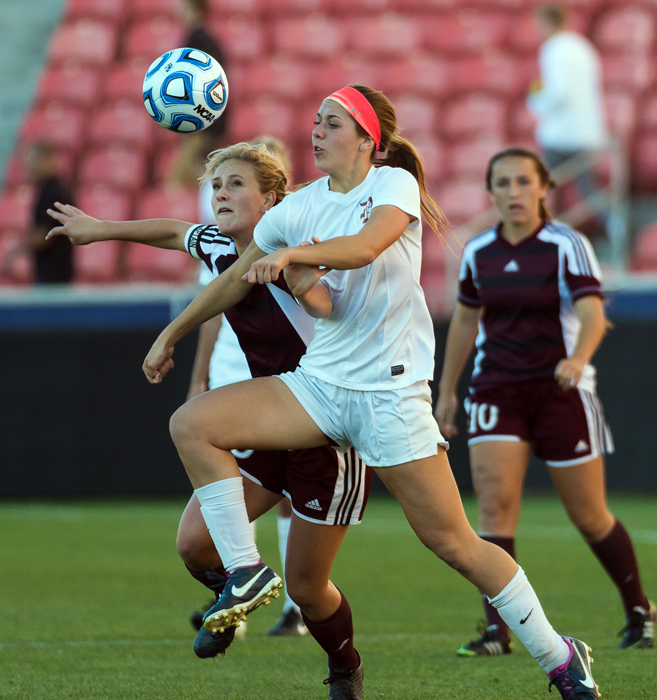 It was a tough end to an amazing season for Lone Peak 19-1 Lone Peak and the first state championship in girls soccer in 20 years for Davis, and the combination of the Knights’ full year success and the streak-stopping win by the Darts is No. 15 on our list of top stories of the year. With the youth and depth of these two teams, it won’t be surprising if a late-season rematch is in the offing for the 2015 season. Phongsavath knows his team will get a lot of attention. “We bring back nine starters. We’ll have a lot of expectations,” Phongsavath said. “We have a big target on our back. We do and always have anyways. Being at Davis, we’re everybody’s big game, especially the girls. We’ve won seven of the last eight region championships, been to five of six semifinals, so we’ve always had that target on our back.